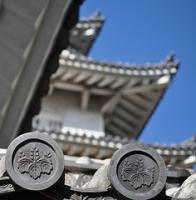 Himeji-jo is a well preserved wooden castle, combining both functional use and aesthetic appeal. The castle is also known as Shirasagi, the white heron, because of its gracefulness. Its origins date to 1333, when Akamatsu Norimura built a fort on top of Himeyama hill. The fort was dismantled and rebuilt as Himeyama Castle in 1346, and then remodeled into Himeji Castle two centuries later in 1581. The current building is still the over 400 years old original. The castle consists of 83 buildings, and has a highly developed defense system. The (wooden) walls are stuck with fireproof white plaster. They have openings for firing guns and shooting arrows, and also for pouring boiling water or oil on unwelcome visitors. Although the castle always looks very impressive on pictures, you cannot see it from the Himeji railwaystation. Only when you enter the castle grounds the building unfolds itself in for your eyes. In my opinion, the building can use some (white) paint. On the inside it is a normal castle, with long and empty halls. You can climb to the 6th floor, but to be honest: there is not much to see. I visited Himeji-jō on a half-day trip from Kōbe in early 2017. Trains from Kōbe and Ōsaka are fast and frequent, and from Himeji station, one can easily walk towards the castle. The shiny white castle overlooks the uneventful city and is surrounded by a water-filled moat. Kōko-en Garden is just west of the castle and a nice place to spend half an hour. The ticket price for the castle was 1,000 JPY (1,040 JPY with the garden). After removing your shoes, the castle can be entered and the upper floors climbed. In the colder season, visitors should put on the offered slippers as the wooden floorboards turn freezing cold. I have visited a handful of Japanese castles and found Himeji-jō to be the most beautiful. Visiting in February 2016, we were fortunate in our timing because the castle has recently been through a period of renovation in which the whole main tower (or keep) was covered in scaffolding. Today it looks pristine, and fully deserving of its Heron moniker. It is an impressive structure, though there isn't much of interest besides the view of the city whilst you traipse around the inside of the castle with your shoes off. I visited this WHS in November 2009. It is a fine example of Japanese wooden castles with multiple roof layers from the Shogun period. A bit out of the way but really worth it! I have visited Himeji Castle twice, once in winter and once in early May. The castle was more visible in winter but it was magnificent with all of the new spring foliage surrounding it. I would like to visit it again in the fall with the leaves changing colors. Definitely a must see in Japan. I was the first foreigner married there at the Shinto Shrine so we were treated like royalty. The Sakura (Cherry) blossoms were blooming and hundreds of people congradulated us. It was a time to remember forever. I made a special trip out of Kyoto, just to see that one castle. I wasn't impressed when I first saw it from the train (approaching Himeiji City), but that feeling was dispelled when I finally got to explore it and climb to the top of the keep/donjon. I went through every bailey possible, and even went out the back entrance, only to backtrack and experience the impressive rear approach as well. What most people miss is the engineering subtleties of the rock foundations and the interior timber framing (especially for the keep). All in all, it lived up to its' reputation. I recommend it for anyone that visits Japan, and who is interested in castle architecture. Himeji-jo must be the most beautiful castle in Japan. 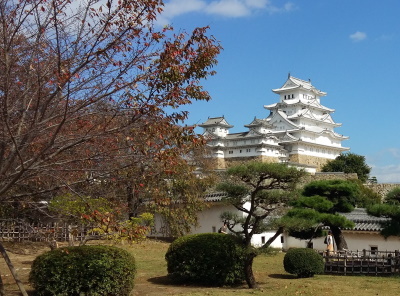 You can view the castle from Himeji Train Station, or by the way of Shinkansan near Himeji. It really like a flying crane. Climbing to the top of the castle was an very exciting. I could watch all over the city around. Fantastic! A glorious reminder of Japan's history. The workmanship that must have gone into this castle is incredible. 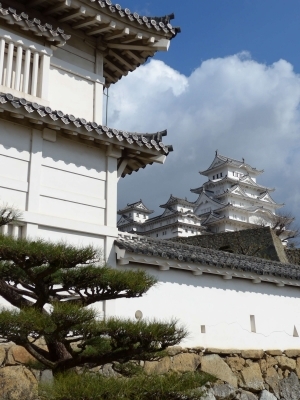 Himeji-jo is, without question, one of the premier sites in all Japan. This should be a prime destination for someone visiting Japan. We visited Himeji-jo on a rainy, windy day when a typhoon was carving its way through the middle of Honshu. It is spectacular, set high on a hill easily seen from the train as you pass through Himeji. A 15 minute walk up the hill brings you to what was the middle moat (the outer moat was where the train station now stands!). It is empty of furniture, but contains samurai armour, ancient guns and weapons, writings and paintings of Daimyo. Actually, it has a very warm feel to it, because of all the timber - a pleasant change to the cold stone castles of europe. There are spectacular views from the 6th floor - just use your imagination to see all the people living within it's moats and walls. Toyotomi Hideyoshi: Hideyoshi took over Himeji Castle in 1576, using it as a base of operations against the rulers of the Chugoku region.